Profit with Options will challenge you every step of the way, and the valuable "Q&A" section at the end of each chapter offers you the rare chance to test your options knowledge before going into real-world trading situations–where time and money are something you cannot afford to lose. In clear, easy-to-follow terms, Profit with Options arms you with the facts you need to understand options–stock, index, and futures options–as well as the tools you need to implement profitable options trading strategies. Whether you're looking for new investment sources in a bear market or seeking hedge protection in a bull, Profit with Options is a lively, one-stop reference and vital tool that can help you achieve your investment goals. 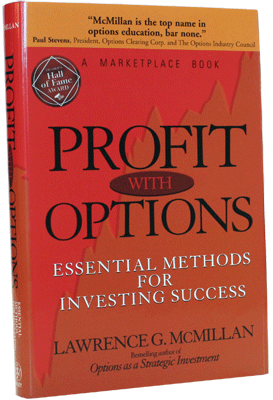 "McMillan is the top name in options education, bar none."